Everything has a start. In my case, the spark lighted up in my head one day (to be honest can’t remember how it happen, I guess we should track back to post number 1) as I was continuously overwhelmed by the amount of Bicycleporn I saw in one of my favorite cities, Berlin. It all began in summer 2010. 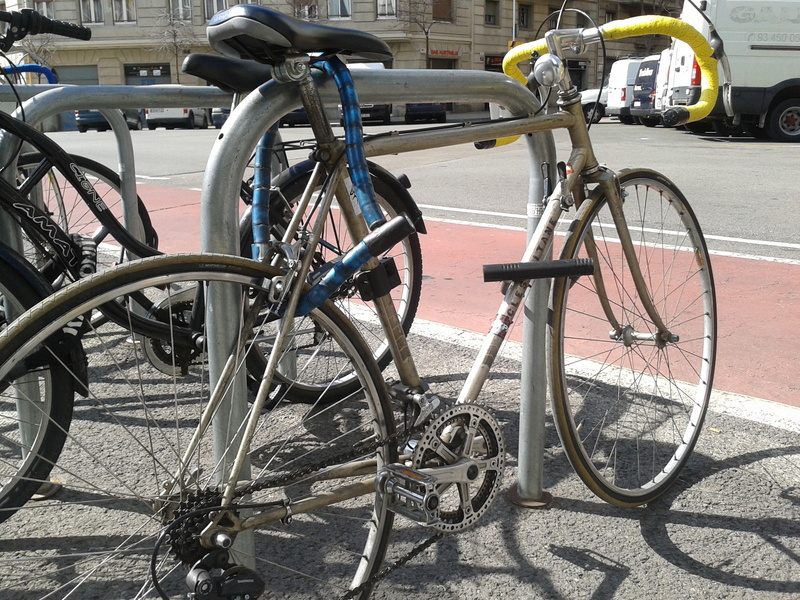 I was in love with the city and the way bicycles where so ubiquitous there, and such beautiful bicycles…it was a change from the hideous mountain bicycles I was used to seeing in Sydney where I lived before moving temporarily to Berlin. And so It was good really good to be back to the city in May, seeing my old friend C., constant source of Bycicleporn, and have an intense weekend of partying and eating. 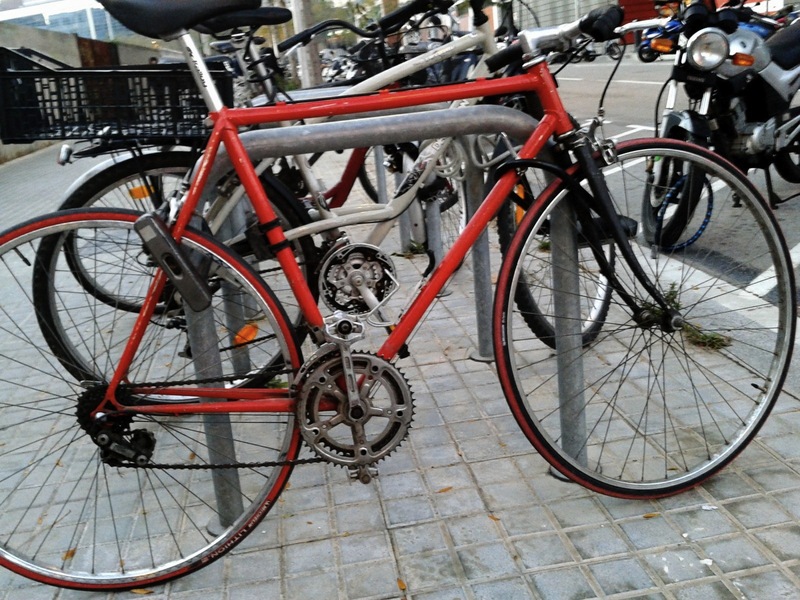 And what a super cool, 80’s bicycle we have here. Love the bell in the handle bar too. Security above all! I won’t lie to you, dear reader. 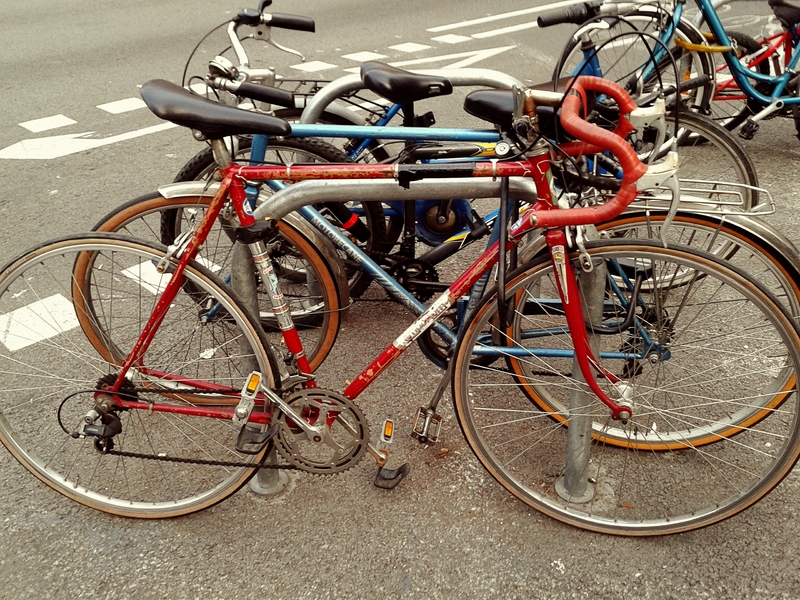 Today’s photos (the first in a while) are going to be about just that; red bicycles and yellow handlebars, or a combination of both. In the period where I have remained silent (for various reasons, but fortunately not due to a lack of Bicycleporn in my daily life) my beautiful bicycle has mutated from blue to fluoro back-to-the-80s pink and it is now very happy with its new look. 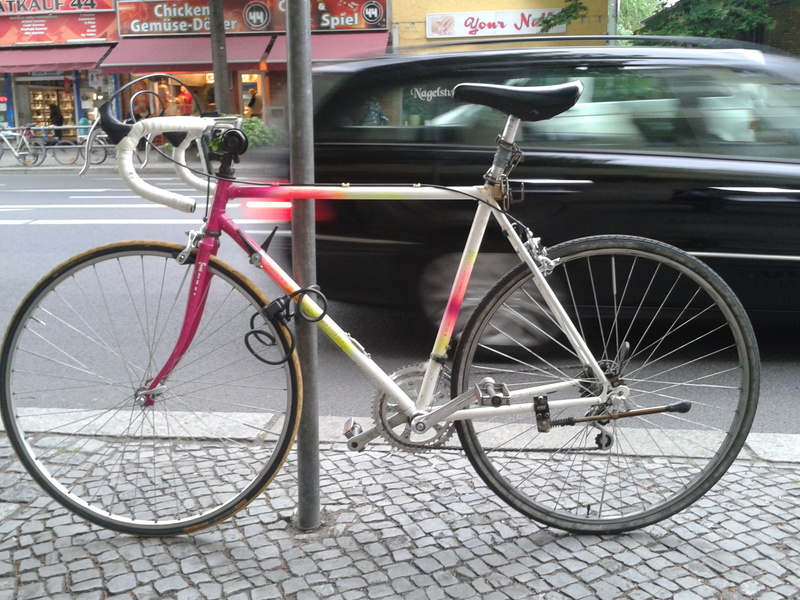 It’s girly enough with the pink touch, but it’s still a racing bicycle so I get everyone’s “respect” immediately. Well that’s at least the original idea, reality is obviously different. So, let’s pull out some fresh news. Well, not so fresh anymore but still worth mentioning. I went with a team of aficionado road bicycle riders to as far as Castelldefels, which is almost 30km from Barcelona. You made that right: 60km return! All alone, no one pushing me! I like this kind of challenges you know, at one point I thought I wouldn’t make it, I felt too much pain in my legs. But I did, and it was super fun. These guys (the “leader” is an older guy, about 50, a former Spain race champion who owns the bike shop near my place) are really into it, training during what we call the “siesta hours” (a.k.a. Spanish 3-hour lunch break) and racing on the weekends. I joined them twice, the second time I was even wearing the super pro shoes (Yeah ok – I fell on the road once too, but only on the way back because I didn’t react fast enough to having my foot stuck in the bicycle when we stop on a red light!). And after that, I love to hang out with them, they are actually super nice and I would say that they do respect me after I managed to do those 60km without complaining too much. I was quite proud of it to be honest. I never thought I would do something like that. And it made me remember something: watching, all bored during the siesta hours, the Tour de France every July in my grandma’s house in the north of Spain. In a way, I could feel their pain and I could only wonder why would a human being put himself into such suffering. Watching their agonizing sweat faces, I thought it was the hardest of all sports. Man against the machine kind of thing. Real endurance. And well, obviously I’m far from feeling anything similar to being at the Tour de France (but do you imagine? ha!) but I think I comprehend now why is it that men love this sport, going up and down a hill. It’s both a combination of joy and pain. 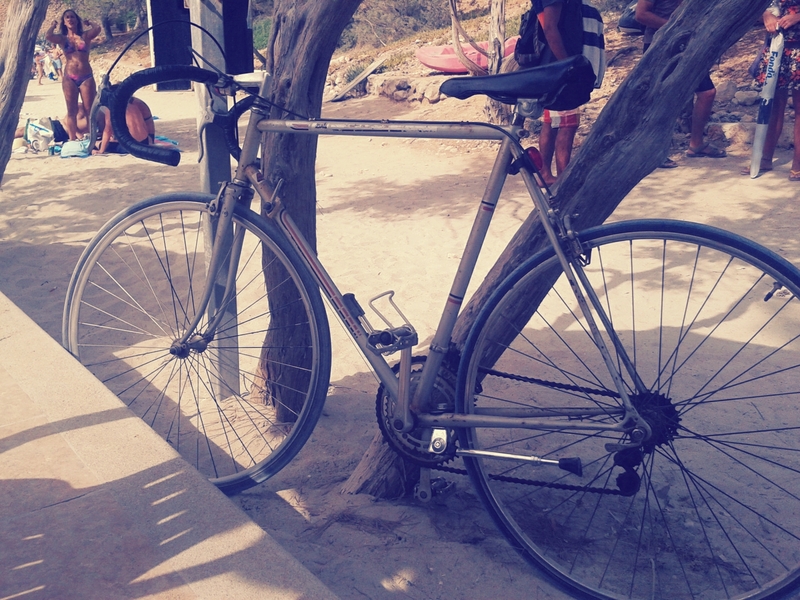 I’m again in the island of Ibiza this summer, and this time I brought my bicycle over on the boat. It was quite an adventure really. I have to admit, much to my mother’s satisfaction (her wise words being: “It’ll be too hot, you won’t use it”) , that it wasn’t the best idea: it’s way too hot during the day and I live to far from town to be able to use it everyday as I did in Barcelona (Mother 1 – Daughter 0). Still, I use it to go to the supermarket. Sad, I know. I think I’ll stop here. I could go on, but I guess I have to leave some surprises for the next post. 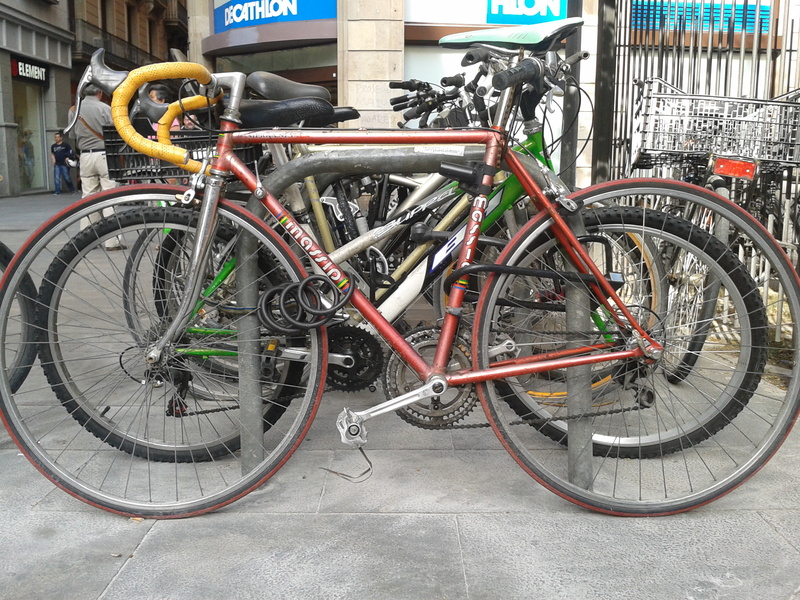 I have some super interesting bicycleporn to share in the next days:) Hope you enjoy this collection of red bicycles and yellow handlebars.